Sarpy County Board Chair Don Kelly today took part in a ceremony to honor the 55th Wing Association, Alumni and active service members at Veterans Park in Papillion. Commissioner Kelly thanked all of the Veterans in attendance for their service, and emphasized the important role Offutt Air Force Base plays in our community. As part of the ceremony, the Commissioner read a Proclamation on behalf of Sarpy County honoring the 55th Wing Association and Alumni. Rep. Don Bacon (right) took part in an event to honor the 55th Wing Association and Alumni at Veteran's Park in Papillion. Papillion Mayor David Black served as the master of ceremonies. Nebraska State Sen. John Arch spoke today at a ceremony to honor the 55th Wing Association, Alumni and active duty service members. Papillion Mayor David Black and Sarpy County Commissioner Don Kelly. Nebraska requires residents who own depreciable tangible personal property to file a Nebraska Personal Property Return and Schedule every year. This form must be filed by May 1, 2019, with the county assessor where the personal property is located. Failure to meet the deadline will result in a 10% penalty added to the tax due. If filed after July 1, a 25% penalty will be added. A Nebraska Personal Property Return and Schedule must be filed for all depreciable tangible personal property that is: owned or held on Jan. 1 of each year; or leased from or to another person. The Sarpy County Assessor’s Office is located on the second floor of the administration wing at Sarpy County Courthouse, 1210 Golden Gate Drive, Papillion. Repairing or rebuilding a flooded home? Please submit both the completed application and the estimate to the Sarpy County Planning and Building Department for review. You can email the documents to planning@sarpy.com or bring them to the Planning Office in the Sarpy County Courthouse. The Sarpy County Board waived all permit fees related to repairing or demolishing flood damaged structures. However, permit fees will still apply for complete rebuilds. Should you proceed without the necessary permits to do so, you assume any and all risks and liabilities associated with construction or repair. Sarpy County is not responsible for construction or repair it did not permit, inspect or approve. Once we have reviewed your application and supporting materials, we will contact you to let you know whether the type of construction or repairs you would like to complete comply with Federal and County Flood Regulations. The graphic below shows the general analysis that is followed by the Planning and Building Department when making this determination. Finally, keep in mind that every property owner’s situation is unique, and we are available to answer your questions. Please feel free to contact us at 402-593-1555 or by email at planning@sarpy.com. APRIL 1, 2019 – As floodwaters continue to recede, Sarpy County remains focused on flood recovery and helping people return to their homes as quickly and safely as possible. The Sarpy County Public Works Department has already repaired and reopened a number of roads across the county, and crews continue to make repairs as more areas become accessible. Several roadways, including Fairview Road and 252nd Street, suffered critical failures. Engineering work is already underway to repair these roads. Teams from the Sarpy County Planning and Building Team are working 7 days a week to provide follow-up pre-connect electrical inspections for homes that sustained flood damage. As more areas become accessible, they continue to do initial assessments as well. Any resident with a driver’s license or identification that shows a Betty, Chris or Hanson Lakes address can access those communities 24 hours a day. All other access will be limited to the hours of 7:30 a.m. and 10 p.m. The floodwaters across Sarpy County are likely to be contaminated with sewage and other hazardous materials. Avoid direct contact with the floodwater and use caution when handling items that have come in contact with floodwater. Flooding can create conditions favorable for tetanus, and uncommon but very serious disease. Contact your healthcare provider to inquire about the status of your tetanus vaccine. It is recommended that adults receive a booster for tetanus every 10 years. As floodwaters recede, mold is a major health concern. Homeowners and volunteers cleaning structures affected by flooding should be prepared to protect themselves by utilizing appropriate personal protective equipment, including long pants, long sleeve shirts or jackets, sturdy boots, work gloves and N-95 respirators. For more information on health concerns related to flooding, visit the Sarpy/Cass Health Department website: SarpyCassHealthDepartment.org. Through March 26, 432.9 tons of debris have been removed from flood-affected areas. Household hazardous waste should be taken to Under the Sink at 4001 S. 120th Street in Omaha. This includes cleaning products, paint, paint remover, antifreeze, automotive batteries, automotive fluids, caulk, aerosol cans, adhesives, garden chemicals, pool chemicals. For a complete list of what they accept, visit underthesink.org. For information about how to dispose of chemicals safely, visit https://www.cdc.gov/disasters/chemicals.html. Anyone whose home, business or property was damaged by the flooding can apply for federal disaster assistance. Apply online at DisasterAssistance.gov. Anyone with questions can call the FEMA Disaster Assistance Helpline at 800-621-3362. FEMA opened a Disaster Recovery Center in Bellevue at 3802 Raynor Parkway, Suite 201. Recovery specialists from the FEMA and the U.S. Small Business Administration will provide information on available services, explain assistance programs and help survivors complete or check the status of their applications at the center. The center is open from 7 a.m. to 7 p.m. seven days a week. Applicants for disaster assistance should have the following information on hand: Social Security number, address of the damaged primary residence, description of the damage, information about insurance coverage, a current contact telephone number, an address to receive mail and a bank account and routing number so funds can be directly deposited. A number of unsolicited contractors have requested access to restricted communities in Sarpy County. The Sarpy County Sheriff’s Office is not allowing contractors into these communities unless a home/property owner contacted that specific contractor. Use caution when hiring firms to help with cleanup, demolition or construction. Never sign anything without reading it first. Only do business with companies and individuals you trust. If you have concerns, contact the Better Business Bureau before signing any contract or agreement. An electrical inspection may be required by local or state electrical authorities before service can be restored by OPPD. If you have access to your property, you can submit an application for an electrical permit online or by calling 402-593-1555 between 8 a.m. and 5 p.m. Team Rubicon, an international nonprofit organization dedicated to disaster relief, is on hand and ready to provide assistance to those who need help cleaning homes and properties. To request assistance, call 833-556-2476. Southern Baptist Disaster Relief, a network of state-based volunteer teams, has volunteers available to help clean or offer emotional support. To request assistance, call 501-954-0495. The U.S. Small Business Administration opened a Business Recovery Center to provide a wide range of services to businesses impacted by the severe winter storm, straight-line winds and flooding. The center is at Bellevue University’s John Muller Administrative Services Building, 812 Bruin Boulevard in Bellevue. It is open from 9 a.m to 6 p.m. Monday through Friday and 9 a.m. to noon on Saturday. “SBA customer service representatives will meet with each business owner to explain how an SBA disaster loan can help finance their recovery. They will answer questions about SBA’s disaster loan program, explain the application process and help each business owner complete their electronic loan application,” said SBA Director Tanya N. Garfield. Sarpy residents and business owners affected by flooding may qualify for tax relief. Learn more by contacting the IRS office in Omaha at 844-545-5640. USDA Farm Service Agency office in Omaha can provide assistance to ag producers. They can also provide assistance with the Livestock Indemnity Program and reporting lost machinery. To contact the Omaha Service Center, call 402-896-0121. Nebraska National Guard members are assisting deputies at several entry points across the county. We ask everyone to remember that Guard members are citizens who have stepped away from their jobs to help Sarpy County and its residents, and to be patient as there could be waits at the entry points. Those affected by flooding can get supplies at the distribution center at 8425 W. Center Road (former Canfield’s store) in Omaha. Items available (while supplies last): bottled water, mops, buckets, shovels, rakes, bleach, work gloves and household cleaning supplies. Hours: 9 a.m.-6 p.m. Monday-Saturday; noon-5 p.m. Sunday. This website is hosted by local churches and organizations in cooperation with the Sarpy County Emergency Management Agency to provide information for flood victims and volunteer opportunities. The state’s website connects people to flood-related resources and assistance. Residents concerned about pets or livestock should contact the Nebraska Humane Society at 402-444-7800 ext. 1. Some insurance agencies are asking residents for documentation of the evacuation notices. If your property has been assessed and does not have power, you will need an Electrical Pre-Connect Permit. Sarpy County Commissioner Don Kelly joined officials from across the metro to help Gov. Pete Ricketts accept the Governor's Cup award from Site Selection Magazine. Nebraska earned the top spot for the third year in a row by having the most new projects per capita. The Omaha metropolitan area, which includes Sarpy County, also earned the top spot for the fourth time in five years for metros with a population of 200,000 to 1 million. Growth and economic development in Sarpy County was a major factor in the award. Read Site Selection Magazine's March 2019 issue, which includes all of their annual awards. The Sarpy County Board of Commissioners is pleased to announce that William E. Conley is joining Sarpy County as the new Chief Financial Officer. In his role, Conley will lead the Fiscal & Budget Department and oversee the county’s annual budget. He will begin his new position in April, replacing Brian Hanson, who is retiring after more than 33 years with Sarpy County. “Sound financial stewardship is incredibly important in county government, especially one that’s growing as quickly as Sarpy County. Under Brian Hanson’s watch, we’ve earned the highest possible bond rating and maintained a healthy cash reserve, all while operating under a balanced budget. But he’s leaving the county in very capable hands. Bill Conley’s experience makes him the ideal candidate to lead our fiscal efforts through the challenges ahead of us, from financing a new jail to developing partnerships to improve mental health care across the region,” said Sarpy County Board Chair Don Kelly. Conley brings more than 35 years of financial leadership to his new position, most recently as the Director of Finance & Infrastructure at the Northstar Foundation and Omaha Outward Bound School. He spent nine years as Vice Chancellor for Business & Finance at the University of Nebraska at Omaha, where he oversaw a campus-wide budget of more than $350 million and more than $500 million in capital projects. Conley earned his bachelor’s degree from the University of Nebraska-Lincoln and his master’s degree from UNO. He has held numerous community leadership roles, including with the Offutt Advisory Council, Westside Community Schools Foundation Board, Strategic Air & Space Museum Board of Directors, Heartland Chapter of the American Red Cross and Mid-America Council of Boy Scouts of America. What is an Emergency Crisis Stabilization Center? A stabilization center is a medical facility where people experiencing mental health crises receive short-term care and treatment before being transferred to a longer-term program. Those options include residential treatment facilities and outpatient programs. If a person is facing a serious criminal charge, they may be transferred to a correctional facility. What type of services are offered at this type of facility? Services may consist of assessment, diagnosis, abbreviated treatment planning, observation, case management, individual and group counseling, skills training, prescribing and monitoring of psychotropic medication, referrals and linkage. Service delivery is offered on a 24-hour basis to address the person’s immediate safety needs, develop resilience and create a plan to address the cyclical nature of behavioral health challenges and future behavioral health crises. Why is this type of facility needed in Sarpy County? Currently there is no mental health facility of this type in Sarpy County. As a result, people experiencing mental health crises often end up in the county jail, which is neither designed nor equipped to treat them. Hospital emergency rooms also deal with people in crisis, but the wait to see a mental health practitioner can be hours, allowing the person’s condition to further deteriorate. The facility will be available to all law enforcement agencies in the Region 6 Behavioral Health area. In addition to Sarpy County, this includes Cass, Douglas, Dodge and Washington counties. If space and staffing levels allow, it may be opened to other agencies. Will the stabilization center take walk-ins? Can family members bring people there? The primary use for the facility will be for those who come in contact with law enforcement. However, we are very early in the process of developing the operational plan for the facility and don’t want to rule out any possibilities at this time. As we build partnerships with various organizations and service providers, more options may become available. We don’t want to rule out any good idea this early in the process. Will you treat adults and children? The initial plan for the facility will be to treat adults. However, as we build partnerships with various organizations and service providers, more options may become available in the future. We want to remain open to good ideas. What happens when a person is stabilized? Will they just be released? A term we often hear is “treat and street.” First, we don’t like that term. Second, that is not our intention with this facility. The stabilization center will be the initial phase of care, where people dealing with crisis are stabilized, then connected with the next phase of treatment. That could be a longer-term facility, outpatient programs or other follow-up services. If the person is facing serious criminal charges, they will be transferred to a correctional facility. What’s the end game? What is the ultimate goal of the facility? Ultimately, the County hopes to improve mental health care in Sarpy County. Our jails and emergency rooms have become de facto treatment facilities. That does nothing but criminalize a medical issue and continue the cycle where people fall into crisis and find themselves dealing with law enforcement and the criminal justice system. We want to break that cycle by providing initial, stabilizing treatment and finding follow-up care and services. Where does the County intend to build the stabilization center? Sarpy County purchased 6 acres of land near Nebraska Medicine Bellevue to hold the facility. It is near 25th Street and Highway 370, though it isn’t directly at the corner. The land is approximately a quarter- to a half-mile south of the intersection. Did the County look at other properties? How about vacant buildings? Sarpy County officials looked at a number of properties across the county, including existing buildings. However, no vacant building met the space and configuration needs without extensive renovation, which can often cost as much as or more than a new building. By building our own facility, we can ensure that it meets our needs now and in the future, which is particularly important in a growing county. It also allows us to include space for other service providers and programs. This site has a number of advantages. It is close to a major medical facility and easily accessible from Highways 370 and 75. Also, Bellevue is the largest city in the county, so it makes sense to put the facility where the population is centered. If you mapped all of the Emergency Crisis Response Team calls, this facility is centrally located within the response area. The short answer is: we don’t know yet. We have a few sketches of what the facility could look like, but those are based on generic specifications. Now that we have a site and are developing the operating plan, we can design the facility to our exact specifications and needs. It will look like a medical building, not a correctional facility. Based on initial estimates of space needs, the building is estimated to cost between $10-$13 million. Those costs could change as more formal plans for the location and building are finalized. How will the County pay for the facility? Sarpy County purchased the land for $1 million. Moving forward, we intend to pursue a public-private partnership model, where we engage private companies and other government agencies to help us build and operate the facility so it doesn’t fall entirely on the taxpayers. This may include partnerships with medical providers, service organizations and other government entities. User fees from outside agencies as well as Medicare, Medicaid and private insurance reimbursements will also offset some of the costs. Will the building be secure? Will it be safe? The stabilization center will be a medical facility, not a jail. However, because it’s primary purpose will be to stabilize those who come in contact with law enforcement, including those who are facing criminal charges, it will be a secure facility. Security will be a focus throughout the planning, design and implementation phases. Will the building hurt neighboring property values? This will be a stand-alone medical facility built adjacent to a hospital. Nearby residential property values should not be affected. The presence of the stabilization center could make nearby commercial properties more attractive to other medical and service providers, increasing the value of nearby vacant properties. When a child enters the foster care system, they often feel overwhelmed, trapped in a revolving door of caseworkers, attorneys and judges. At Sarpy County CASA, we work to be a constant in the lives of more than 400 abused and neglected children in Sarpy County. As a Court Appointed Special Advocate (CASA), you can help ensure that a child’s needs are being met while they reach a safe, permanent home. CASA volunteers are not foster parents. They are trained volunteers who get to know a child in the foster care system and advocate for their best interests. CASA volunteers must be at least 21 years old and commit to at least one year of advocacy. Our next CASA volunteer training session begins in April. Classes are on Monday evenings from 6-9 p.m. If you have questions about Sarpy County CASA, please visit SarpyCASA.com, call 402-593-2259 or email casa@sarpy.com. For several years, Sarpy County has been actively working to address two major issues: jail overcrowding and the growing mental health crisis, two intertwined problems. With very few secure treatment facilities available in the area, people experiencing a mental health crises often end up in the county jail, which isn’t designed or equipped to meet their needs. These inmates tend to spend more time in jail and return more frequently, exacerbating the overcrowding issue. Sarpy County has already taken a number of steps to address this issue, with the goal of finding treatment for people with mental illnesses, not incarcerating them. The county’s Mental Health Diversion program diverts people to treatment instead of toward punishment. The Mental Health Case Management program, recognized as a national leader by the National Criminal Justice Association, provides intensive supervision to those in custody or awaiting trial while also offering treatment referrals and help establishing independent living skills. But officials recognize that more progress needs to be made. To lead this effort, Sarpy County formed a Mental Health Leadership Team with representatives from the Sarpy County Board of Commissioners, Sheriff’s Office, County Attorney’s Office, Public Defender’s Office, County Administration and Region 6 Behavioral Health. The Leadership Team identified the need for a crisis stabilization center as a top priority. Following the team’s recommendation, on Tuesday, the County Board voted to purchase approximately six acres of land near Nebraska Medicine-Bellevue for the facility. Though still in the preliminary design phase, the facility is expected to cost $10-$13 million to build, with projected operating costs between $2-$2.5 million a year. The stabilization center will be available to all law enforcement agencies in the Region 6 service area. “The Sarpy County Sheriff’s Office believes psychiatric emergencies are medical, not criminal, and persons in mental health crisis should be provided the proper care and services to avoid future contacts with law enforcement. Establishing a mental health crisis stabilization center would allow persons with a mental illness to receive proper treatment and avoid incarceration, furthering Sarpy County’s goal to decriminalize mental illness,” said Sarpy County Sheriff Jeff Davis. Sarpy County will use cash on hand to pay the $1,050,000-purchase price for the land located southeast of 25th Street and Highway 370. “We knew this would take considerable investment, so we’ve been saving for both a mental health facility and a new jail.” Kelly said. Commissioners are currently evaluating final sites for a jail. A decision is expected within the next 30 to 60 days. To learn more about the site and mental health needs in Sarpy County, view the presentation given to the Sarpy County Mental Health Leadership Team. The Sarpy County Assessor's Office has mailed the 2019 Nebraska Homestead Exemption forms to property owners who filed for the Nebraska Homestead Exemption last year as well as those who requested forms be mailed to them for 2019. The completed forms are due June 30. You can email your completed forms to the Assessor's Office at homesteadexemption@sarpy.com. 1. Persons over age 65. 2. Veterans totally disabled by a nonservice-connected accident or illness. 4. Qualified totally disabled veterans and their widow(er)s; unremarried widow(er)s of a servicemember who died on active duty. 5. Veterans whose home was substantially contributed to by the Department of Veterans Affairs and their widow(er)s.
6. Individuals who have a developmental disability. Sarpy County is partnering with the City of Omaha to transform a mile-long stretch of Harrison Street from 147th to 157th Street. The two-lane road is being upgraded to a four-lane arterial street with turn lanes and medians. The project will improve safety and travel times in the area. Preliminary work on the project began in late 2017 with tree removal and the construction of noise-reduction walls. Phase 1, which was completed in November 2018, included reconfiguring the intersection of 156th and Harrison streets. Phase 2 is scheduled to start this spring, with the final phase complete in late 2019. The public is invited to attend a construction kick-off meeting and open house from 5:30-7 p.m. on Monday, Feb. 18. The meeting will be at Andersen Middle School, 15404 Adams St. The main parking lot is on the north side of the school. Additional parking may be available on the south side of the school and on Adams Street. The meeting will include a brief presentation at 5:45 p.m. to share information and a projected timeline for the second and third phases of construction. An open house will follow until 7 p.m., during which time team members from Sarpy County, the City of Omaha and Olsson will be available to discuss the project and answer questions. More information is available on the project’s website: HarrisonStreetProject.com. Calling the Census a county-wide priority, Sarpy County Commissioners today appointed Michelle Y. Andahl to serve as Executive Chair of the county's Census 2020 Complete Count Committee. Local governments across the country form Complete Count Committees to plan and implement outreach efforts to publicize the importance of the Census, with particular focus on traditionally undercounted populations. "In addition to determining how many federal and state legislative representatives we have, the Census figures play a huge role in determining how federal funds are distributed," said Commissioner Don Kelly. "Any individual not counted is a loss of potential funding for the county. As a Board, we're committed to a complete and accurate Census count, and I know that under Michelle Andahl's guidance we'll get that." Andahl has 25 years experience leading grassroots and community marketing campaigns on the local, statewide and national level. Her role as Election Commissioner gives her a unique working knowledge of Sarpy County's population distribution and the challenges of counting every resident. "I'm incredibly honored to lead this important countywide effort and excited to begin recruiting key community partners and business leaders to serve on Census 2020 Complete Count Committee," Andahl said. Members of the committee will be named in the coming weeks. The official selection committee voted 3-0 today to name Angela Burmeister as the District 3 representative on the Sarpy County Board of Commissioners. Burmeister, Managing Partner at Berkshire & Bermeister Law Offices, is the chair of the Nebraska State Bar Association’s Legislation and Annual Meeting committees. Since 2013, she has represented District 4 on the Nebraska Supreme Court’s Unauthorized Practice of Law Commission. She graduated from Bellevue West High School, then attended the University of Nebraska-Lincoln, where she received her bachelor’s degree in Business Administration. She received her law degree from Creighton School of Law. Burmeister serves on the Girl Scouts Spirit of Nebraska Board of Directors and the Omaha Children’s Museum’s Guild Board. She served on the Fontenelle Forest Board of Directors from 2009-2017, including one term as President of the Board. The District 3 seat became vacant when Brian Zuger resigned on Jan. 2 to assume the position of Sarpy County Treasurer. He was elected to the new position in November. Burmeister will serve the remaining two years of the term. Per state statute, the Sarpy County Attorney, County Clerk and County Treasurer served as the selection committee. Fourteen applicants met the Jan. 18 deadline to apply and were considered for the position. To help customers affected by the winter weather this week, the Sarpy County Transfer Station will have extended hours on Saturday, Jan. 26. The site will be open from 6 a.m. to 2 p.m. If you have questions, please contact the Transfer Station at 402-253-2371. To learn more about what items are and aren't accepted as well as a list of rates, visit the Sarpy County Transfer Station's webpage. The seat became vacant when Brian Zuger resigned on Jan. 2 to assume the position of Sarpy County Treasurer. He was elected to the new position in November. Per state statute, County Attorney Lee Polikov, County Clerk Deb Houghtaling and County Treasurer Zuger will serve as the selection committee to choose the new Commissioner. The committee will interview candidates on Friday, Jan. 25, in the Sarpy County Boardroom in the Sarpy County Courthouse. The session is open to the public. Each candidate will be given five minutes to make a statement about their qualifications and why they want to serve, followed by up to 10 minutes of questions posed by the selection committee. Following the interviews, the committee will meet in a closed session to discuss the candidates. They will then return to regular session to make their final votes. An increasing number of people have fallen victim to fake DMV websites, according to the Sarpy County Treasurer’s Office. These websites illegally collect personal information, credit card numbers and money while posing as a representative of the Nebraska Department of Motor Vehicles. In Nebraska, dmv.Nebraska.gov is the only website where you can renew your vehicle registration and license plates. Verify the URL before entering any personal information. You will never have to enter the year, make or model of your vehicle. Your renewal charge will never be $9.99 or $19.99. There are no advertisements on the official Nebraska DMV website. Fake sites often include ads for insurance or gift cards. When you look at your bank or credit card statement, the charge should be listed as “Nebraska.gov DMV Plate …” If the charge is listed under any other name, contact your bank or credit card company immediately. dmv.Nebraska.gov is a safe and secure way to renew your registration. However, if you don’t feel comfortable completing your registration online, there are other options. You can send your renewal payment through the mail or you can renew in person at the Sarpy County Treasurer’s Office in the Sarpy County Courthouse. No matter which method you choose for your renewal, make sure you have proof of insurance available. If you have questions about vehicle registration in Sarpy County, please contact the Sarpy County Treasurer’s Office at 402-593-2148 or dmv@sarpy.com. Sarpy County Emergency Communications Director Bill Muldoon (from left), Dispatcher Casey Wadas, Walmart representative Amy Vaccaro and Dispatcher/Outreach Coordinator Jenny Peoples pose for a photo with the Outreach Program's new 911 simulator. The Sarpy County Emergency Communications Department has an updated 911 simulator, thanks to a grant from Walmart. Dispatchers use the simulator as part of their Outreach Program to give kids hands-on experience with 911. The update will allow the children to dial or text 911 from a provided cellphone, which is routed to an instructor who acts as if the call or text was an actual emergency. Currently, 81% of all 911 calls to the Sarpy County Emergency Communications Center come from wireless phones. Unlike landlines, cellphones don't provide exact locations to the dispatch center, so it is important for callers to know their location. The upgraded simulator will help dispatchers teach kids the importance of that information when they visit schools and other community events across Sarpy County. A new traffic signal is now operational at the intersection of Highway 370 and 192nd Street. The signal was turned on just after 10 a.m. on Jan. 15. The new signal will improve traffic flow and safety along the highway near Gretna. The Nebraska Department of Transportation is responsible for the state highway system, including installing traffic signals. However, Sarpy County agreed to lead the project to speed up the installation timeline. “I applaud the Sarpy County Engineer and the Public Works Department for stepping up and leading this important project. It will be a huge safety improvement for drivers leaving Aspen Creek, and it should take some pressure off of the roads leading to and from the nearby Gretna schools,” said Sarpy County Commissioner Jim Warren. Permanent equipment and poles will be installed in the coming months to replace the temporary poles now in operation at the intersection. The safety of drivers along Highway 370 is a priority for the Sarpy County Board and they will continue to push the state for more safety improvements. The preliminary property assessments for all residential properties in Sarpy County are now online. To view the assessment for your property or neighboring properties, visit the Sarpy County Property Search tool on our website. To use the Property Search tool, it's easiest to enter your house number in the "Address" field, then hit "Submit." A list of properties will come up. Click on "View Details" next to the property you are looking for. The 2019 preliminary assessment will be listed under "Valuation Information." The Sarpy County Assessor’s Office encourages all residential property owners to review their preliminary assessment. If you have questions or concerns, the Assessor’s Office encourages you to reach out to speak with them directly. They can address many issues and corrections without the need for a formal protest, saving you time and effort. Touting the need for experienced leadership, Sarpy County Commissioners today elected Don Kelly to serve a fourth consecutive term as Chair of the Sarpy County Board. Kelly represents District 1, which covers the southeast corner of the county. He was first elected to the board in 2013. His current term expires in December 2020. Commissioners also re-elected Jim Warren to serve as Vice Chair, a position he has held since 2017. Warren represents District 5 in western Sarpy County. Approved an agreement with E&A Consulting Group for professional services related to improvements on Giles Road from 192nd Street and Highway 6. Accepted a Justice Assistance Grant for the Mental Health Case Management program, which assists mentally ill persons involved in the criminal justice system by providing services designed to help them establish independent living skills, manage their mental illness and reduce future contacts with the criminal justice system. If your Christmas tree is starting to look a little dry and droopy, it’s time to recycle it. Please remove all ornaments and decorations from the trees. If you bag the tree before bringing it to a recycling site, please remove the bag. Sarpy County Assessor Dan Pittman, Commissioner Jim Warren, Commissioner David Klug, District Judge Nathan Cox, Clerk of the District Court Dori Heath, County Treasurer Brian Zuger, County Engineer Dennis Wilson and County Attorney Lee Polikov. Family, friends and Sarpy County employees filled the Sarpy County Boardroom on Jan. 3, 2019, as seven newly elected officials took their oaths of office. • Clerk of the District Court Dori Heath – Heath is starting her first term in office after serving as Chief Deputy Clerk of the District Court for two years. Before joining Sarpy County, Heath was the District Court Clerk in Colfax County for 14 years. She received her bachelor's degree from Nebraska Wesleyan University and her master's degree from Creighton. • County Assessor Dan Pittman – Pittman is starting his sixth term as Assessor. He was first elected in 1998. Pittman earned his bachelor's degree from Grace University and his master's degree from Bellevue University. He also served in the U.S. Navy for six years. • County Attorney Lee Polikov – Polikov has served as Sarpy County Attorney since 1999. He spent 26 years working at the Sarpy County Sheriff's Office. He received his law degree from the University of Nebraska-Lincoln. • County Engineer Dennis Wilson – Wilson was first elected in 2010 as the Sarpy County Surveyor, a role that was changed to Engineer. In this role, he oversees the Sarpy County Public Works Department. • County Treasurer Brian Zuger – Zuger is starting his first term as Treasurer. He served as a Sarpy County Commissioner for two years representing District 3. Zuger received his bachelor's and master's degrees from Bellevue University. • Commissioner David Klug – Klug is starting his first term representing District 2 on the County Board of Commissioners. He served for 12 years on the Papio-Missouri River Natural Resources District Board of Directors. He is the Director of Process for Think Whole Person Healthcare. He received his bachelor's and master's degree from the University of Nebraska at Omaha. • Commissioner Jim Warren – Warren, who represents District 5, is starting his third term on the Board of Commissioners. He served on the Gretna City Council for two years and was Mayor of Gretna for 12 years. Warren is a member of the Gretna Volunteer Fire Department and has served in various offices for that organization. He earned his bachelor's degree from Toccoa Falls College. Sarpy County Attorney Lee Polikov and Clerk of the District Court Dori Heath were sworn in to office today. County Assessor Dan Pittman (standing, from lef) and Commissioners David Klug and Jim Warren took their oaths of office today in the Sarpy County Boardroom. District Judge Nathan Cox presided over today's ceremony, which saw seven newly elected Sarpy County officials take their oaths of office. Brian Zuger, County Commissioner District 3, has resigned his seat (effective January 2, 2019) after being elected to serve as Sarpy County Treasurer. Pursuant to Nebraska Rev. Statute 32-567, his successor is to be chosen by the County Attorney, County Clerk and County Treasurer. Such vacancy is to be filled within 45 days of the occurrence of the vacancy. The Sarpy County Board and Board of Equalization meet most Tuesday afternoons at 3 p.m. and attend various additional meetings as required. Must be a registered voter within Commissioner District #3. The appointed person will serve until December 31, 2020, and candidates wanting to be elected into the seat will have to be on the election ballot in November 2020 for January 2021. If the appointed person wishes to continue to serve on the Board, he or she would have to run for election. Interested individuals are asked to submit an application/release form to the Sarpy County Clerk, Attention: Board Secretary, 1210 Golden Gate Drive, Papillion, NE 68046, by the close of business, 4:45 p.m. on Friday, January 18, 2019. Click here to download the application/release form. A public meeting will be convened at 9 a.m., Friday, January 25, 2019, for the purpose of interviewing applicants and appointing the new commissioner for District 3. Members of the Board of Commissioners are collectively responsible for establishing policy, adopting an annual budget, and providing vision and goals to the Administrator(s). The following outline is a brief description of the various duties of Board Members. The description is not intended to be comprehensive, but rather it is an effort to summarize the primary responsibilities of the Board. Board Meetings are scheduled every Tuesday at 3 p.m. Meetings typically last between 1 hour and 2.25 hours. Other time commitments may include liaison assignments, local group meetings and various executive meetings, special meetings and training events. Board members are compensated $26,095 annually. The Sarpy County Courthouse will be closed on Jan. 1, 2019. Emergency operations will remain open. Most services are available on www.Sarpy.com. Sarpy County is joining the Omaha Regional Interoperability Network (ORION), which operates the Land Mobile Radio (LMR) system for the Omaha Public Power District and Douglas, Washington and Pottawattamie Counties, including emergency communications for the cities of Omaha and Council Bluffs. Sarpy will contribute its radio core and the two systems will be joined by implementing Dynamic System Resilience (DSR). DSR ensures uninterrupted radio coverage in the event of a prolonged power outage, equipment failure or physical damage to a primary radio core. DSR enables the system to switch automatically to a backup core to assure radio availability, reliability and network management. Sarpy has been in talks with ORION since March 2018 and accepted Sarpy’s membership request in November. The Sarpy County Board of Commissioners and the governing boards of the ORION membership approved the agreement at their respective meetings this week. “Joining ORION is an important step for Sarpy County. It adds a layer of redundancy to our emergency communications systems and allows us to develop close partnerships across the region that benefit our first responders,” said Sarpy County Emergency Communications Director William Muldoon. Currently, both ORION and Sarpy County own and operate their own radio systems, which support critical communications for each agency. The project to merge the two systems is expected to take 12 to 15 months. The new system will allow emergency dispatchers and first responders from different agencies to communicate with one another more effectively through a single radio system. The merger will also decrease costs for individual agencies, as they no longer have to support separate systems. The system is being built with future expansion in mind. Ahead of its move to a new space at Werner Park, the Sarpy County Tourism office is temporarily relocating to the Sarpy County Courthouse. Starting Dec. 17, the Tourism office will be open on the first floor of the Courthouse’s administrative wing. The space previously housed the DMV’s Drivers Licensing office. 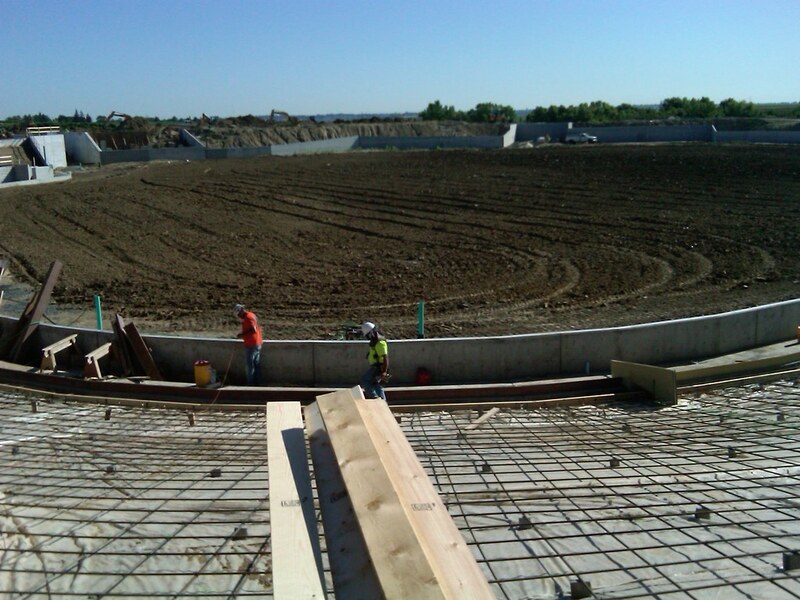 In the Spring, the Tourism office will move to its new home at Werner Park, which is currently under construction. The partnership with the Omaha Storm Chasers will give the Tourism Department more visibility, as thousands of people visit the stadium each week during the baseball season. The new offices will be larger and offer more parking than the current location. The Sarpy County Board of Commissioners today adopted a new Road Improvement Policy that lays out how the County will plan, fund and prioritize road projects. “Sarpy County is growing at an amazing rate, and that growth will continue to put pressure on our already limited resources. This policy gives us a path to better prioritize road projects and support economic development across the County,” said Sarpy County Board Chairman Don Kelly. As part of new policy, the County Engineer will develop a three-year road program that will be implemented through the County’s annual budget. The three-year plan will help provide a clear picture of what funds will be required in future years. The policy also incorporates the County’s existing practice of collaborating with private developers to build and improve roads. “We don’t have an unlimited amount of money for roads, so by identifying the County’s contributions and establishing partnerships with the development community, we’ll be able to make tax dollars go farther,” Kelly said. Approved two agreements to improve the redundancy and resiliency of the County’s emergency communications network. The Board approved resolutions to join the Omaha Regional Inter-Operability Network (ORION), which operates a Land Mobile Radio System, and VIPER (Voice Over Internet Protocol for Emergency Response), a multi-node phone system. Granted permission to seek bids for professional engineering services for the final design of the intersection at 108th Street and Platteview Road. The Sarpy County Sheriff's Office and the Omaha Police Department will hold an amnesty day for guns, ammunition and fireworks on Jan. 19, 2019. Bring your unwanted guns, ammunition or fireworks to the Sarpy County Sheriff's Office from 10 a.m. to 2 p.m. No questions asked. The Sheriff's Office and the Omaha Police Department will dispose of the items safely. The Sarpy County Transfer Station has shifted to a winter schedule, which changes when the station is open. Dec. 24: 6 a.m. to 2 p.m.
Dec. 29: 6 a.m. to 3 p.m.
Jan. 5: 6 a.m. to 3 p.m. The Transfer Station accepts most solid waste, including household trash, appliances, tires, roofing materials and more. It is located at the landfill site, 14414 S. 156th Street, Springfield. For a full list of rates and prohibited items, check out the Sarpy County Transfer Station's webpage. Sarpy County 911 dispatcher Katie Porter (center) received a Life Saving Award from Emergency Communications Director William Muldoon (left) and Medical Director Eric Ernest. Sarpy County 911 dispatcher Katie Porter received a Life Saving Award at today's Sarpy County Board of Commissioners meeting. On Oct. 10, Porter answered a 911 call from a woman asking for help for her husband, who was on the floor and not responding. She quickly dispatched crews from the Bellevue Police Department and Bellevue Fire and Rescue, then began CPR instructions for the caller. Porter counted out loud with the caller to verify the chest compressions were being performed correctly and kept the woman focused until EMS arrived. The rescue crew transported the patient to Nebraska Medicine Bellevue, where he was successfully resuscitated, and he has since been released. "Your role in the chain of patient care worked successfully, and together with law enforcement and EMS personnel, a life was saved," Sarpy County Emergency Communications Director William Muldoon said while presenting Porter with the award. 'Tis the season for giving! We will be collecting new toys for the Sarpy County Holiday Assistance Program at the Winter Wonderland Celebration in Papillion. The Sarpy County Holiday Assistance Program allows families who meet low income guidelines to receive new toys to give to their children on Christmas. If you would like to donate, please bring a new, unwrapped toy to Papillion Fire Station #3 at 146 North Adams Street from 4:30-8 p.m. on Nov. 24. If you would like to donate but cannot attend the Nov. 24 event, please contact Sarpy County Human Services at 402-593-4414 or sboehmer@sarpy.com. The Sarpy County Election Commission is predicting a 53% voter turnout in Sarpy County for the 2018 Gubernatorial General Election. With record breaking numbers for voter registration and early voting ballot requests, numbers for the 2018 mid-term are more on par with a presidential election year. In the 2104 mid-term General Election, 12,000 voters requested Early Voting Ballots. This year, more than 25,000 Early Voting Ballots have been requested and more than 18,000 have already been returned with 5 days remaining until Election Day. During the 2016 General Election, 31,000 voters requested Early Voting Ballots. If voters want to cast an early ballot, they can visit the Sarpy County Election Office through 5 p.m. Nov. 5 to vote in person or take a ballot home with them. The Election Office is at 501 Olson Drive in Papillion. It shares the same parking lot as Jerzes Bar and Grill. Look for the giant inflatable Early Voting Eagle on top of the office. Ballots can be mailed in or dropped off in the Election Office during business hours. Ballots also can be dropped off 24 hours a day, 7 days a week at one of the four ballot drop boxes located around Sarpy County. The Sarpy County Election Commission is pleased to announce that Sarpy County has surpassed 113,000 registered voters for the first time, with 113,132 eligible voters registered for the Nov. 6 election. Early voting also has hit a record high for mid-term elections in Sarpy County, with 24,792 Early Voting Ballots requested by mail. An additional 3,000 voters have already cast their ballots at the election office. “I want to encourage each one of our 113,132 voters to cast their ballot in this year’s general election,” said Andahl, who added that voters must return their Early Voting Ballots to the Election Office or one of four drop boxes by 8 p.m. on Nov. 6. In 2014, 101,144 people registered to vote in the mid-term elections. The statewide general election will be Tuesday, Nov. 6. Polls will be open from 8 a.m. to 8 p.m. on Election Day. Sarpy County is experiencing a crisis, and we are not alone. Counties across the country a facing a shortage of treatment facilities, meaning people experiencing mental health crises often end up in a county jail while their cases work through the criminal justice system. Sarpy County already has taken a number of steps to address these issues, but officials recognize that there is more progress to be made. To lead this effort, Sarpy County established a Mental Health Leadership Team with representatives from the Sarpy County Sheriff’s Office, County Attorney’s Office, County Administration, Board of Commissioners, Public Defender’s Office and Region 6 Behavioral Health. Bexar County, Texas – Over the past 15 years, Bexar County, which is home to San Antonio, has focused on collaboration to identify and treat people with mental illnesses. The coalition brings together law enforcement, judges, government officials, community leaders and the medical community. Two key parts of the program are the San Antonio Police Department’s mental health unit and The Center for Health Care Services - The Restoration Center, a one-stop shop for people in need of treatment and social services. Pima County, Arizona – Identified as a model site by the Bureau of Justice Affairs, Pima County focuses on investing in and supporting behavioral health initiatives, including court-ordered evaluation services and behavioral health services for people detained at the jail and juvenile detention center. They also built two state-of-the-art facilities, a Crisis Response Center and a Behavioral Health Pavilion. The county leases these facilities to organizations that provide crisis and behavioral health services in the County. In addition to looking at model sites, the Leadership Team is also working to coordinate services currently available in Sarpy County. Team members and community partners from across Sarpy County took part in a Sequential Intercept Mapping exercise sponsored by Region 6. The exercise created a “map” of how people dealing with mental health crises come in contact with and flow through the criminal justice system. The map shows opportunities for intervention, where people can be redirected toward treatment. The exercise also identified a number of gaps where additional treatment options are needed, including the need for a crisis stabilization center for use by Sarpy County law enforcement agencies. Sarpy CASA needs volunteers! Help make a difference in the life of a child! At Sarpy County CASA, we work to be a constant in the lives of more than 200 abused and neglected children in Sarpy County. As a Court Appointed Special Advocate (CASA), you can help ensure that a child’s needs are being met while they reach a safe, permanent home. CASA volunteers are not foster parents. They are trained volunteers who get to know a child in the foster care system and advocate for their best interests. CASA volunteers must be at least 21 years old and commit to at least one year of advocacy. Our next CASA volunteer training session begins in February 2019. Classes are on Monday evenings from 6-9 p.m. If you would like to volunteer, please fill out an application form, then return it to the CASA office via email, fax or in person. The Sarpy County Sheriff’s Office, The Sarpy County Attorney’s Office and the Drug Enforcement Agency, along with community sponsors, are hosting their annual Fall Medicine Drop on Oct, 27, 2018. Bring any expired or unused medication to the HyVee parking lot in Shadow Lake (Hwy 370 & 72nd Street) between 9 a.m. and noon. No needles, syringes, aerosol containers or liquids will be accepted. This is part of an ongoing effort to rid homes in our community of unnecessary, unused and expired medications. Do your part to ensure these medications do not end up in the wrong hands or in our water system. Everything collected is incinerated, container and all, so no personal information is compromised. Drive up, drop off, drive away. No questions asked. As any community grows, it is important to have a well-defined plan. This is especially true in Sarpy County, the fastest growing county in the state. Community planners guide growth by working with elected officials and members of the public, as well as professionals from different fields such as public health, recreation and engineering. They help leverage public and private funds that lead to business growth, job creation and economically resilient communities. In Sarpy County, the result of this work is the Sarpy County Comprehensive Plan, which incorporates the growth plans for the five cities and creates a unified vision for the build-out of the county. The plan, developed by the Sarpy County Planning Department and Sarpy County Planning Commissioner with input from key stakeholders and the public, received the Daniel Burnham Award for Outstanding Comprehensive Plan from the Nebraska Chapter of the American Planning Association. The proclamation coincides with National Community Planning Month, which was established in 2006 as a way to highlight the importance of community planning. This year’s theme is “Housing as Community Infrastructure,” emphasizing the important roles housing plays in creating community. That’s the number of people currently living with a mental illness in the United States, according to the National Institute of Mental Health. If you apply those numbers to Sarpy County, that’s more than 36,000 people dealing with some type of mental health issue, ranging in severity from mild to serious. But there are very few secure treatment facilities available in the area. As a result, people experiencing mental health crises often end up in the county jail, which isn’t designed or equipped to meet their needs. Sarpy County has already taken a number of steps to address this issue, with the goal of finding treatment for people with mental illnesses, not incarcerating them. The County is an active partner in Region 6 Behavioral Healthcare, which coordinates a network of mental health and substance abuse providers; and Sarpy County’s Mental Health Diversion and Mental Health Pretrial programs work with people in the criminal justice system to help them find available treatment and resources. Earlier this year, Sarpy County established a Mental Health Leadership Team to guide a coordinated County-wide response. The team includes representatives from the Sarpy County Sheriff’s Office, County Attorney’s Office, County Administration, County Board of Commissioners, Public Defender's Office and Region 6. Sarpy County recently received an $81,700 grant from the Bureau of Justice Assistance, part of the U.S. Department of Justice, to help fund this effort. The County will use the funds to provide a social worker to help law enforcement deal with individuals experiencing mental health crises, to help identify gaps in mental health services and to deal with opioid addiction. In the coming weeks, we’ll provide more information about the County’s efforts to address mental health needs, how mental health issues affect the inmates at the Sarpy County jail, and the need for a mental health facility in the county. Sarpy County Human Services is again partnering with service agencies from across the county to offer the Sarpy County Holiday Assistance Program. Through the program, families who meet low income guidelines can apply for assistance in receiving new toys from their children who are 14 years old and younger. To apply for the Holiday Assistance Program, please visit one of these sign-up events. 9 a.m.-noon and 3-6 p.m.
Sarpy County Deputy Lindsay Varona’s new patrol cruiser is personal, and it’s pink. Varona will be the first deputy to drive the department’s new Breast Cancer Awareness cruiser. The Sarpy County Sheriff’s Office unveiled the new themed cruiser at a ceremony on Oct. 8. The design includes a pink hood, pink ribbons and the message "Early detection saves lives." A ring of ribbons on the back of the cruiser also pays tribute to other types of cancer. Rep. Don Bacon and Karen Daneu, the CEO of Susan G. Komen Great Plains, served as the keynote speakers for the event. Bacon spoke about his younger sister, Beth, who died in 2006 after a battle with breast cancer. Daneu said she hopes the cruiser's message will help the Susan G. Komen organization meet its goal of cutting the breast cancer death rate in half by 2026. Sarpy County Sheriff Jeff Davis, whose sister is a breast cancer survivor, emphasized that the Breast Cancer Awareness cruiser is a working vehicle that will be on routine patrol for three years. “Hopefully, someone sees this cruiser and gets the message, because it's true that ‘early detection saves lives’,” he said. In honor of Breast Cancer Awareness Month, the Sarpy County Sheriff’s Office has designed a special patrol cruiser. Deputies will drive the themed cruiser on routine patrol for the next three years as a way to raise awareness year-round. 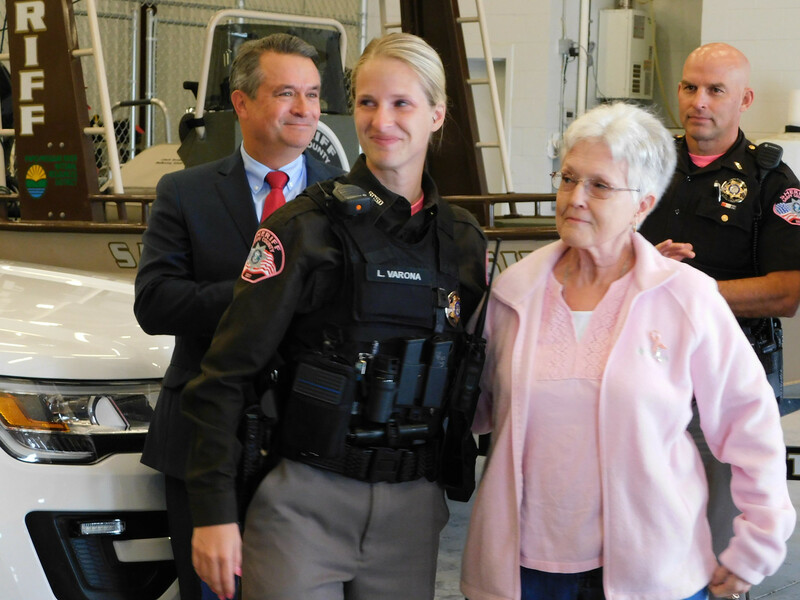 The Breast Cancer Awareness patrol cruiser will be unveiled at 11:30 a.m. on Monday, October 8, in the north parking lot of the Sarpy County Sheriff’s Office, 8335 Platteview Road in Papillion. Rep. Don Bacon and Karen Daneu will be the keynote speakers. Rep. Bacon’s sister lost her battle to breast cancer at the age of 39; his mother is a breast cancer survivor. Karen Daneu is the CEO of the Susan G. Komen Great Plains Affiliate. The event is open to the public and all cancer survivors are encouraged to attend. In July, more than 500 Sarpy County taxpayers appealed their property valuations to the Sarpy County Board. During this annual review, the Board sided with approximately 50 property owners who challenged how the first acre of their agricultural land was valued by the Sarpy County Assessor’s Office. The total change in valuation is approximately $1.35 million, which means the County Board reduced the overall tax base by just under $4,000. The Assessor’s Office filed an appeal with Nebraska Tax Equalization and Review Commission, seeking to have the reduction reversed. County Board Chairman Don Kelly criticized the Assessor’s decision to file an appeal because it may require both sides to hire outside representation at the County’s expense. "The Board and the Assessor are represented by the County Attorney, so to avoid a conflict of interest we may have to hire two different outside lawyers and probably spend well over the $4,000 the Assessor is challenging. This is just a colossal waste of the taxpayers’ money on the part of the Assessor’s Office, and I’d prefer that office focus its efforts on ensuring the accuracy of valuations of" all types of properties across the county,” Kelly said. The new Sarpy County Early Ballot Drop Box at 1248 Golden Gate Drive. Sarpy County voters have three new convenient locations for returning their ballots for the upcoming general election. The Sarpy County Election Commission installed secure, drive-up Early Ballot Drop Boxes in Bellevue, Papillion and Gretna, said County Election Commissioner Michelle Y. Andahl. “Voters have been requesting more locations where early ballots could be returned. They wanted locations closer to where they live and work; and they wanted more options that didn’t rely on the mail system. Our hope is that the new Early Ballot Drop Boxes will make returning early ballots easier for everyone in Sarpy County,” Andahl said. An existing drop box outside the Election Commission office, 501 Olson Drive, was moved onto an island in the office’s parking lot to make it more accessible. Each drop box features three locking mechanisms and is secured to a cement pad, Andahl said. The boxes will be available 24 hours a day, seven days a week during the election cycle, and Election Commission employees will empty the boxes each day. Visit the Sarpy County Election Commission website. Over the past week, the Sarpy County Election Commission sent Early Voting Ballot Request applications to more than 110,000 eligible voters in Sarpy County. In addition to allowing the voter to ask for a ballot by mail, the form also provides the name and address of the voter’s polling location. In April, around 30,000 voters in Sarpy County received notice that their voting place had changed ahead of the May Primary Election. Sarpy County Election Commissioner Michelle Andahl said her office relocated the polling sites out of kindergarten through 12th grade schools with the help of local businesses and faith-based organizations. The Election Commission is asking voters, even those not requesting a ballot by mail, to keep the request applications to use as a reference for finding their correct polling locations. The Election Commission will begin mailing early voting ballots on Oct. 1. All ballots must be returned to the election office by 8 p.m. on Nov. 6. Early in-person voting at the election office begins Oct. 9. No early voting ballots can be returned to a polling place. On Tuesday, the Sarpy County Board of Commissioners approved a 4-year labor contract with three separate public unions. The new contracts will provide an annual 2 percent base wage adjustment. The Board unanimously approved the contracts with the Sarpy County Public Employees Association and two units of the Fraternal Order of Police. The Board also approved pay schedules for managers, non-union employees, assistant public defenders and deputy county attorneys. The three bargaining units represent the County’s dispatchers, non-sworn employees of the Sheriff’s Office and administrative workers. A similar agreement with the Nebraska Public Employees Union Local 251 is expected in the next few weeks. “A four-year contract provides budget stability and lets us plan farther ahead, which is critical as Sarpy County continues to grow,” Warren said. The Sarpy County Board of Commissioners today approved the appointment of Tracy D. Jones as Sarpy County Veterans Service Officer. Veterans and Veterans’ issues; and represents Sarpy County Veterans in local communities and on Veterans organizations. Jones served for 28 years in the United States Air Force, retiring as Command Chief Master Sergeant of the 100th Air Refueling Wing in Mildenhall, England. He deployed in support of Operations Desert Shield, Desert Storm, Southern Watch, Enduring Freedom and Iraqi Freedom. He received his Bachelor’s Degree in Management from Bellevue University and his Master’s Degree in Human Relations from the University of Oklahoma. “I am very excited to take care of our Veterans. They put it all on the line for us, and I can’t think of a better honor than to serve them,” Jones said. He will start his new role on Sept. 17. Cops and robbers will be filling the streets of La Vista on Oct. 20 — all in the name charity — as the Sarpy County Crime Stoppers 5K Run/Walk returns for a second year. The family-friendly event kicks off at 10 a.m. at Kros Strain Brewing Company and ends with a post-race party featuring Sarpy County first responders. Participants are encouraged to come in costume, as either a cop or a robber. The $20 registration fee includes a race bag and retro Crime Stoppers socks. Thanks to our community partners, 100% of the registration fees will go to Sarpy County Crime Stoppers, which supports law enforcement agencies across the county. Several area businesses and organizations are serving as community partners for the race, including Nebraska Crossing Outlets, Omaha Lancers, Tobacco Education Advocacy of the Midlands, Apple Roofing and Farrell’s eXtreme Body Shaping. We are excited to report that we received more than 35 applications for the Veterans Service Officer position. After reviewing all of the applications, members of the Veterans Service Committee, along with Sarpy County officials, will interview several finalists. Together, we are dedicated to appointing a Veterans Service Officer that will provide outstanding service to all Sarpy County Veterans and their families. In May, the Sarpy County Board of Commissioners awarded a bid to install traffic signals at the intersection of 192nd Street and Highway 370. The County’s goal was to have the signals installed before the start of the Gretna Public Schools’ school year. We did not meet that goal. An ordering issue has pushed the project’s completion date back several weeks, so we have shifted our efforts to installing temporary signals, and will work to get those in place as soon as possible. The County Engineer's Office is responsible for installation of the temporary and permanent traffic signals. The safety of all drivers along Highway 370 remains a priority for the Sarpy County Board, and the Board is working to implement procedures to prevent delays on future road projects. If you have questions or concerns about current or future Sarpy County road projects, contact Sarpy County Engineer Dennis Wilson at 402-537-6900. On Aug. 10, the first three phases (Phases 1A-1C) of the Harrison Street Project will reopen. Harrison Street will reopen from 156th Street to just east of 154th Street, and 156th Street will reopen from Gertrude to Adams streets. The intersection of Harrison and 156th will have temporary stops signs until the traffic signals are completed. Work on Phase 1D of the project also will begin on Aug. 10. At that time, Harrison Street will close from 156th Street to 161st Avenue for the removal of old pavement, grading, storm sewer work and paving the new roadway. This closure does include the entire intersection of Harrison and 157th streets. The closure for Phase 1D will last until early October, depending on weather. Please use caution in this area and use the marked detour. Phases 2 and 3 will begin in the spring of 2019. For updates, please visit HarrisonStreetProject.com. The Sarpy County Board of Commissioners has approved an expanded tuition assistance program for County employees and their families. The new program, offered in partnership with Bellevue University, features tuition reimbursement of up to $5,250 for County employees and $2,500 for employees’ immediate family members. The program is available to full-time, degree-seeking students at Bellevue University. There is no cost to the County or taxpayers for the program. The Sarpy County Board of Commissioners approved the three-year partnership program at its meeting on July 17. Approved a resolution to partner with the City of Omaha and Douglas County on improvements to the intersection at 180th and Harrison streets. The project will cost $308,870.75, with Sarpy County paying 50% and Douglas and Omaha each paying 25%. Approved a Memorandum of Understanding with OPPD, Douglas County, Washington County and Pottawattamie County, Iowa, signaling Sarpy’s intent to work collaboratively with the Omaha Regional Interoperable Network (ORION), a public safety radio network. Highway 370 is about to get a lot smarter. Traffic signals connected with cameras and fiber optic cables will improve traffic flow, cut drive times and increase safety, making Highway 370 in Sarpy County the smartest roadway in Nebraska. The new technology is part of $600 million the state will spend on road projects in 2019. “Gov. Ricketts along with state and local leaders have made funding for infrastructure a priority, and we’re putting every dollar to work in the most efficient and effective way possible to build a safe and modern transportation system,” Nebraska Department of Transportation Director Kyle Schneweis said July 5 at a press conference to announce the projects. Improving safety on Highway 370 has been a priority for the Sarpy County Board of Commissioners, who earlier this year asked the state to defer decisions on traffic signals on the highway to Sarpy County officials in an effort to cut the time required to install a light. Commissioners also met with NDOT officials to push for more investment in Sarpy County roads. The County currently is partnering with the state and other entities to install lights at three intersections on Highway 370, at 192nd, 150th and 66th streets. It’s almost the Fourth of July, and fireworks festivities are in full swing across Sarpy County. And so are the complaints. So Sarpy County Emergency Communications wants to offer a few reminders about when you should call 911 and when you should use the non-emergency number. When someone is hurt. When someone is in immediate danger. When something is on fire. When the emergency situation is happening now. Use the non-emergency number for anything that is not an emergency. These include noise complaints, reports of past incidents, reporting someone using fireworks outside of approved hours. Calling 911 for non-emergency reasons could delay an emergency call from getting through, so please know which number to use. When are fireworks permitted in the cities? Bellevue – 8 a.m. to 10 p.m. from June 25 to July 3; and 8 a.m. to midnight on July 4. Papillion – 8 a.m. to 10 p.m. from June 25 to July 3; and 8 a.m. to 11:59 p.m. on July 4. The Sarpy County Board of Commissioners Tuesday adopted the annual 1 & 6 Year Road Program. The program provides a blueprint for the County's road construction plans though 2024. State statute requires the county adopt a 1 & 6 year plan annually. though the program can be amended by aproval of the County Board. "This is a dynamic document, and we can make changes as needed," Sarpy County Board Chairman Don Kelly said. "And there will be changes." On Wednesday, May 30th, approximately 60,000 Notices of Valuation Change will be mailed to property owners in Sarpy County. The Notice will indicate your 2017 and 2018 assessed value for your property. Do you have concerns with your property value? The county assessor would like to talk with you! Please visit the Sarpy County Assessor’s Web Page and contact us by e-mail, telephone, or personal visit to our office. Sarpy County is the fastest growing county in the state, attracting new residential, commercial and industrial developments. But that expansion doesn’t come without growing pains, according to Sarpy County Board Chair Don Kelly. During a presentation at the Sarpy County Chamber of Commerce’s annual State of the County event on Tuesday, Kelly specifically cited growth as a driving factor behind the County’s need for a new jail and mental health facility. “Sarpy County is at a precipice. And it’s going to take bold actions moving forward to keep up with our growth,” he said. Sarpy County opened the current 148-bed jail facility in 1989, when the county’s population was just over 100,000 residents. It was designed to meet the County’s needs through 2020. However, the jail reached capacity in the mid-1990s, and the County began paying to house inmates at other facilities. When voters rejected a $15.5 million bond issue to add 160 beds to the jail in 2002, the County implemented several Alternative to Incarceration Programs, including pre-trial release, work release, house arrest and diversion services, to keep non-violent offenders out of jail. In 2017, Sarpy County’s population topped 180,000 residents, and the jail held between 150 and 200 inmates a day, in addition to the 40 to 60 housed at other facilities. Another 250 to 300 people participate in the alternative programs. Over the past 10 years, Sarpy County has spent almost $5 million to house inmates at other facilities, some as far away as Buffalo and Richardson counties, in addition to $1 million in transportation costs. The County’s boarding costs are expected to reach $2.9 a year by 2025, which is unsustainable, Kelly said. In his presentation, Kelly laid out the County’s path forward. The next steps include identifying and purchasing land for the new facility; engaging an architectural firm to begin initial design; determining building and operational costs; and continuing transition to a civilian run Corrections Department. The County has already begun the search for a site for the new jail. County staff is working with DLR Architects and HDR Engineering to evaluate potential sites. That team is looking for a site that provides the least impact possible to neighboring properties; does not inhibit future economic development opportunities; is centrally located and easily accessible for all law enforcement agencies in the county; is large enough to be appropriately buffered; and is large enough to support future County facilities. County programs benefit from Omaha Gives! With the help of Lift Up Sarpy County, several Sarpy County programs and the residents they serve will benefit from Omaha Gives! on May 23. The 24-hour online giving event will celebrate nonprofit organizations from across the Omaha metro. This is the first year Lift Up Sarpy has taken part in the fundraiser. Lift Up Sarpy County works to uplift people's lives by bringing together government, nonprofit and faith-based organizations to serve people in need. The organization supports several county programs, including CASA, Mental Health Diversion, Victim Witness Unit, Public Defender's Office, Teen Court and the Sheriff's Office. Omaha Gives! is an online giving platform organized by the Omaha Community Foundation to support philanthropy in the metro area. They host an 24-hour online giving event every May for nonprofit organizations. The event raised more than $7.8 million last year. Donate to Lift Up Sarpy County via Omaha Gives! Sarpy County voters headed to the polls on Tuesday, May 15 for Nebraska’s primary election. Polls closed at 8 p.m. and vote totals will be updated as ballots are counted. If you have questions, contact the Sarpy County Election Commission at 402-593-2167. Sarpy County hosted the Omaha Metropolitan Tourism Awards this week. The organization touts the metro area as a single, three county travel destination. This video was created to promote the area. A lengthy construction project at the intersection of 132nd Street and Giles Road is frustrating area residents, business owners and the Sarpy County Board of Commissioners. Tab Construction, who submitted the lowest bid for the project, closed the road on July 17, 2017. The contract specified the grading, pipe placement and paving should be completed in 75 working days. Holidays, weekends and days when the weather was not conducive to construction work are excluded from the count. Weather and utility issues did prevent work for a number of days. However, the project crossed the 75 working day mark in early December, as calculated by the State, County and County Construction Administrator. As the contract specified, liquidated damages of $3,117 are being assessed for every working day beyond that date. As of May 5, those damages are $105,978. Three legs of the intersection reopened on Dec. 15, however, Giles Road to the west of 132nd Street remains closed. “This project is months behind, and I would expect to see some urgency from the contractor to get it done. But I haven’t seen any urgency from Tab. I would find it extremely difficult to approve any future contract with Tab Construction, and the other commissioners feel the same way,” Warren said. The County Board of Commissioners must approve all bids over $20,000. The Board can consider a company’s previous performance, reputation and efficiency when awarding a bid, according state statute. Sarpy County is responsible for 20% of the $1.95 million project, approximately $389,000. The Federal Highway Administration is paying the remaining portion. Sarpy County is proud to announce that it is hosting Remembering Our Fallen, a photographic war memorial designed to keep fallen service members’ memories alive. The traveling exhibit honors military members from Nebraska who have died since Sept. 11, 2001. It features both military and personal photos, giving visitors a broader look into the lives of each person. Omaha residents Bill and Evonne Williams created the project in 2010 with photos of fallen service members from Nebraska. Through their nonprofit organization, Patriotic Productions, they expanded the project by creating state-specific memorials for display in other states. A national display was unveiled in 2017 at the Lincoln Memorial in Washington, D.C. In addition to their work with Remembering Our Fallen, the Williamses have organized 11 honor flights to take Nebraska veterans to visit the war memorials in Washington. Remembering Our Fallen will be on display at the Sarpy County Courthouse through May 10. It is located on the second floor of the administration wing near the Sarpy County Boardroom. It is free and open to the public. To learn more about the project, to volunteer to host the exhibit, or to add a family member to the display, visit patrioticproductions.org/rememberingourfallen. The Nebraska Department of Motor Vehicles has moved its driver license office in Sarpy County. The license office in the Sarpy County Courthouse closed April 25. The new Driver License Service Center at 4502 Maass Road in Bellevue opened April 30. Motor vehicle titles, registration and plates will still be handled by the Sarpy County Treasurer’s Office in the Sarpy County Courthouse, 1210 Golden Gate Drive in Papillion. Vehicle inspections also will be performed at the Courthouse. If you have questions about vehicle titles, registration or plates, contact the Sarpy County Treasurer's Office at 402-593-2148 or www.Sarpy.com/Treasurer. If you have questions about driver’s licenses or the new location, contact the Nebraska Department of Motor Vehicles at 402-292-0141 or dmv.nebraska.gov. Read the press release from the Nebraska Department of Motor Vehicles about the move. The Sarpy County Sheriff’s Office, The Sarpy County Attorney’s Office and the Drug Enforcement Agency along with community sponsors will hold their annual Spring Medicine Drop on April 28. Please bring any expired or unused medication to the Shadow Lake HyVee parking lot (Highway 370 and 72nd Street) between 9 a.m. and noon. No needles, syringes, aerosol containers or liquids will be accepted. Please help us in our ongoing effort to rid homes in our community of unnecessary, unused and expired medications. Do your part to ensure these medications do not end up in the wrong hands or in our water system. Everything collected is incinerated, including the container, so no personal information is compromised. Sarpy County is participating in a Community Preparedness Study. It is intended to get a better idea of your concerns and preparedness activities related to natural disasters and community emergencies. All Sarpy County residents are invited to participate. The survey only takes about 5 minutes, and after you finish, you can enter a drawing to win a free NOAA weather radio. Your responses to this survey are confidential – no information is collected that will connect you to your survey response. The University of Nebraska Public Policy Center will combine the responses and present its findings to the Sarpy County Emergency Management Agency. Environmental education will come to life with youth activities, demonstrations and more at the Sarpy County Earth Day Celebration & Expo. Green Bellevue's annual event will be from noon-4 p.m. April 29 at the Lied Activity Center, 2700 Arboretum Drive. The celebration is free and open to the public. To learn more about the event, visit GreenBellevue.org/EarthDay. Sarpy County Planning Director Bruce Fountain (center) presents the Daniel Burnham Award for Outstanding Comprehensive Plan to Sarpy County Board of Commissioners Gary Mixan (from left), Don Kelly, Jim Warren and Jim Thompson. Sarpy County recently received the Daniel Burnham Award for Outstanding Comprehensive Plan from the Nebraska Chapter of the American Planning Association. The annual award honors plans based on originality and innovation, engagement, implementation, effectiveness and the role of planners. Sarpy County Planning Director and Nebraska APA President Bruce Fountain presented the award to the County Board of Commissioners on Tuesday. The Board adopted the plan, titled “Potential Meets Opportunity,” in September 2017. It incorporates the growth plans for the five municipalities and establishes a unified vision for the build-out of Sarpy County, the fastest growing county in the state. The plan creates the tools and policies to manage this growth into the future. County Commissioner Jim Warren commended Fountain and the Sarpy County Planning Department for their work. “Most people don’t understand how much work goes into a Comprehensive Plan, but it’s hundreds of hours. I appreciate all of the time and effort Bruce and the entire Planning Department put into this, and I especially applaud the way they included the public in the process,” Warren said. The award nominees were judged by members of the Iowa Chapter of the American Planning Association. Spring is a busy time of year for road construction, and with several projects underway across the county, we want to make sure you know where to get information. If you have questions about road closures or any current or future road projects, contact Sarpy County Engineer Dennis Wilson at 402-537-6900. On Monday, Sarpy County CASA received Bellevue's Community Development Block Grant Achievement Award for 2018 at a ceremony in Lincoln to honor Community Development Week in Nebraska. Sarpy County CASA Director Paula Creps accepted the award from Mayor Sanders and Governor Pete Ricketts. Sarpy County CASA uses block grant funds from Bellevue to operate the Bellevue Family Visitation Center, a training space and family visitation space in Old Towne Bellevue. The Center offers a neutral atmosphere that is family-friendly, safe and comfortable for children spending time with their parents or siblings during what can often be a very difficult and unhappy time. In 2017, Sarpy County CASA advocated for 273 children with 121 CASA volunteers. The volunteers are appointed by judges to speak in court for the best interest of abused and neglected children. Volunteers make placement recommendations after researching the child’s background. The CASA serves as a stable force in the child’s life during difficult times. To learn more about CASA and the Bellevue Family Visitation Center, visit SarpyCASA.com. The Omaha Storm Chasers have called Werner Park home since 2011. As the team celebrates its 50th season, we're looking back at their time in Sarpy County. Click on the arrows to view the gallery. The Sarpy County Board of Commissioners on Tuesday unanimously approved a resolution to ask the state for the ability to decide where and when traffic signals should be placed on Highway 370. Sarpy County is the fastest growing county in Nebraska, despite being the smallest county geographically. The latest estimates from the U.S. Census Bureau put Sarpy County’s population at more than 181,000, a 14.2% increase since 2010. That concentrated growth in residential, commercial and industrial development has created several traffic safety issues on Highway 370. The Nebraska Department of Transportation is responsible for the state highways system, including the installation of traffic signals. The Board will ask the State of Nebraska to enter into an interlocal agreement that defers those decisions on Highway 370 to the Sarpy County Board of Commissioners. “We aren’t pointing a finger at the Nebraska Department of Transportation … they’ve been very engaged in these discussions. But this board is willing to lean as far forward as we can to improve public safety. And that may eventually lead to them ceding the whole highway to us. I’d be in favor of that. It would allow the State to focus on Platteview Road, which could be a true southern bypass. That would benefit the entire metro area,” said Sarpy County Board Chair Don Kelly. Around 30,000 voters in Sarpy County have received notice that their voting place will change ahead of the May 15 primary election. Working with local businesses and faith-based organizations over the past several months, Sarpy County Election Commissioner Michelle Andahl says her office has relocated all polling sites out of kindergarten through 12th grade schools. Andahl said she started connecting with community members and voters soon after entering office, to identify ways in which the election office could better serve Sarpy County citizens. One common theme that arose in those discussions was that of moving polling sites out of schools. Yellow postcards have been mailed to affected voters, letting them know the address of their new polling site. In addition, they will soon receive an application, which they can complete, to receive an early ballot by mail. Get ready for a night of fun and fundraising at Sarpy County CASA’s second annual CASA UnCorked. The evening will feature wine and beer tastings, heavy appetizers, a wine pull, live music and live and silent auctions. All proceeds from the event will go toward CASA’s “Let Kids Be Kids Fund,” which assists with purchasing sporting equipment and team fees, prom attire, senior pictures, driver’s education classes, summer camps and more. These activities provide children in the CASA program with a sense of normalcy in their otherwise chaotic lives. The April 27 event will be from 5:30-10 p.m. at SAC Federal Credit Union, 72nd and Highway 370. Tickets are $40 if purchased before April 1, $50 from April 1-26, and $60 the day of the event. Tickets for the wine pull are $20 and can be purchased online or at the event. Click here to purchase tickets online. Sponsors for the CASA UnCorked include PenFed Credit Union, Shadow Lake HyVee, Midlands Community Foundation, Offutt Spouses Club, Metro Community College, John and Terri Connell, Black Hills Energy Ambassadors, Pinnacle Bank-Gretna, FBG Services, Shrinking Borders LLC, Dr. Gaspard and Dr. Rudersdorf of Family Dentistry of Bellevue, and Carole Hobson. If you have questions about the event or would like to donate, contact Sarpy County CASA at 402-593-2259 or casa@sarpy.com. CASA (Court Appointed Special Advocates) volunteers are appointed by judges to speak in court for the best interest of abused and neglected children. Volunteers make placement recommendations after researching the child’s background. The CASA serves as a stable force in the child’s life during difficult times. In 2017, Sarpy County CASA advocated for 273 children with 121 CASA volunteers. Learn more at SarpyCasa.com. Activities to promote preparedness during Nebraska Severe Weather Awareness Week (March 25-31) have been scheduled across the state as a way to encourage all Nebraskans to get ready for the hazardous weather conditions that can occur during the spring and summer months in Nebraska. A proclamation by Gov. Pete Ricketts signed March 5, reminded Nebraskans that community preparedness can minimize the dangers, which the annual severe weather season presents, to the lives and property of Nebraskans. Many communities will be participating in the annual statewide tornado drill on Wednesday, March 28 at 10 a.m. as part of the week’s activities. Resources for staying prepared are available on the NEMA Website at nema.nebraska.gov. Scroll to the bottom of the front page and select the hazard you want to learn about including: floods, thunderstorms/tornadoes and fire/drought . You can also download preparedness resources including a preparedness kit list and a family preparedness guide. The Wednesday drill offers a time for residents, businesses and industries to test their severe weather emergency preparedness plans. The morning drill will begin around 10 a.m., with the issuance of a mock tornado warning and activation of outdoor warning sirens about 10 to 15 minutes later. If severe weather is possible that day, the drill may be postponed or canceled. March 20: the Sarpy County Board of Commissioners will proclaim the week beginning March 25 as Severe Weather Awareness Week in Sarpy County. Sarpy EMA will also participate in FEMA Region 7’s microburst on Twitter at 10 a.m. and will continue to promote severe weather awareness on Twitter and NextDoor throughout the entire week. March 26: will set up two exhibits that display the poster contest entries received by the County as well as other severe weather preparedness information and materials. The first exhibit will be in the atrium of the Sarpy County Administration Building. The second exhibit will be near the entry of the Sarpy County Courthouse. They will remain there all week. March 29: will host severe storm spotter training provided by the National Weather Service at the Bellevue Fire Training Center at 7:00 p.m. All weather enthusiasts are welcome to attend. March 31: conducting a storm spotter deployment drill at 8:00 a.m. (SCEMA credentialed volunteers only). Contact: Jesse Eret, program specialist, Sarpy County Emergency Management Agency jeret@sarpy.com. Sarpy County Public Works will resume road repairs to 168th Street from Gertrude to Harrison streets on March 26. Because of the nature of the repairs, 168th Street will be closed to through traffic from Harrison Street to Giles Road. 168th Street from Gertrude to Harrison streets will be closed to all traffic. The closure is expected to last 12 working days, depending on weather. A working day is a day when the temperature is above 40 degrees and rising and is suitable for the construction of this project. It does not include Sundays and holidays. Sarpy County Public Works had to suspend work on this project late last year due to unfavorable weather conditions for asphalt construction. We are asking the traveling public to be aware of the closure and to find alternate routes of travel. Local traffic will be allowed to access all properties throughout construction. If you have questions, contact Sarpy County Construction Manager Brian Becker at 402-537-6929. Get ready to Stir Up the Storm! The Omaha Storm Chasers are set to being their 50th season, one filled with flashbacks to honor the team's history and it's long association with the Kansas City Royals. The team will kick off the season at Werner Park on March 26 with an exhibition against the Royals. Opening day is April 5, when the Storm Chasers will take on the Colorado Springs Sky Sox at 6:35 p.m. Season highlights will include flashback games honoring past seasons, a "Star Wars" night and fireworks on Fridays. On June 9, the team will take the field as the Omaha Runzas, wearing specialty uniforms that honor Nebraska's famous food. the opponent: The Albuquerque Green Chile Cheeseburgers. The Storm Chasers moved to Werner Park, which is owned and maintained by Sarpy County, in 2011. In that time, more than 2.7 million fans have enjoyed games in the stadium. They expect to cross the 3 million mark this season. For a schedule of events at Werner Park or to purchase Storm Chasers tickets, visit OmahaStormChasers.com. The public is invited to attend a construction kick-off meeting and open house for the Harrison Street Project from 6-7:30 p.m. on March 22. The meeting will include a brief presentation at 6:15 p.m. to share project information and a projected timeline. An open house will follow until 7:30 p.m.
Sarpy County partnered with the City of Omaha and Douglas County to transform a mile-long stretch of Harrison Street from 147th to 157th Street. The current two-lane road will be upgraded to a four-lane arterial street with turn lanes and medians. The project will improve safety and travel times in the area. Preliminary work on the project began in November, with tree removal and the addition of a noise-reduction wall. The project is estimated to be completed in late 2019. You can also get updates on the Harrison Street Project's Facebook and Twitter pages. From left: Sarpy County Sheriff Jeff Davis, RyAnne Elsesser, Dep. Jessica Manning, Jon Roberts, Sue Roberts, Chief Deputy Greg London, Lodge #3 FOP President Matt Barrall. In October 2017, the Nebraska Lodge #3 of the Fraternal Order of Police partnered with the Sarpy County Sheriff’s Office to participate in the Pink Patch Project, a national fundraiser for cancer charities. FOP members sold specially designed pink patches and t-shirts for the project, which raised $3,500 for Leap-For-A-Cure. The Sarpy County Sheriff’s Office chose Omaha-based Leap-For-A-Cure as their charity in honor of three Sarpy County Deputies lost to cancer between 2011-2013: Ryan Fawcett, Rick Staack and Dave McAnulty. Both Fawcett and Staack passed away due to brain cancer. Leap-For-A-Cure was especially meaningful to Dep. Fawcett, who served as a mentor to Heather Roberts. Roberts’ parents founded Leap-For-A-Cure in her honor. The organization partners with the Methodist Estabrook Cancer Center and the Methodist Hospital Foundation, and 100 percent of the funds raised stay in the Omaha area for awareness, education and treatment of brain cancer. On March 6, officers from Lodge #3, along with Sheriff Jeff Davis and Chief Deputy Greg London, presented patches and a check for $3,500 to Leap-For-A-Cure founders Sue and Jon Roberts and Methodist Hospital Foundation representatives RyAnne Elsesser and Kristi Anthis. The Sarpy County Sheriff’s Office was the first Sheriff’s Office and the second agency in the state to participate in the Pink Patch Project, which began in 2015 at the Irwindale Police Department in California. For the project, Law Enforcement and Public Safety agencies design special patches, often mimicking their department patches with all pink tones, and sell and wear them in the month of October. The Pink Patch Project went nationwide in 2017, with over 130 agencies participating. FOP Lodge #3 thanks Sheriff Davis and the Sarpy County Sheriff’s Office for allowing them to participate in the project as a way to honor the memories and actions of local deputies. On March 3, the outdoor warning sirens in Sarpy County will sound twice as part of a test to ensure all sirens are operational prior to the upcoming severe weather season. The Sarpy County Emergency Management Agency will coordinate the two tests with Sarpy County Emergency Communications, with sirens sounding at 10 and 10:30 a.m. During each test, the sirens will sound for three minutes, which is the same criteria for warnings for tornados and high wind events. Public Safety agencies including Sarpy County Emergency Management, area fire departments and law enforcement, as well as volunteers from CERT (Community Emergency Response Team) and Sarpy County SKYWARN, will document the operational status of each siren. Beginning in April, siren tests are scheduled for 10 a.m. on the first Saturday of each month through October. During the monthly tests, if a resident lives near a siren and does not hear it, they should contact the Sarpy County Emergency Management office at 402-593-5785. As the siren tests resume for the year, it is a great opportunity for families and businesses to review their severe weather emergency plans. Severe Weather Awareness Week, March 26-30, is a good time to practice these plans. Additional information about the outdoor warning sirens can be found on the Sarpy County Emergency Management website. If there are any questions, please contact Sarpy County Emergency Management Agency Director Lynn Marshall at 402-593-5785. Sarpy County Emergency Management hosted a FEMA training class Feb. 17-18 in Gretna. Thirty-three people completed the class, ICS 300: Intermediate ICS for Expanding Incidents, which covered training for personnel who require advanced application of the Incident Command System. The 911 system that we know today started on Feb. 16, 1968, when Rankin Fite, speaker of the Alabama House of Representatives, placed the first 911 call in Haleyville, Alabama. Congressman Tom Bevill answered the call on red phone in Haleyville’s police station. 911 operations slowly spread across the county in the next 20 years. By 1987, half of U.S. residents had access to the system. That number jumped to 98.9% by December 2017, according to the National Emergency Number Association. In that time, technology advanced well beyond the original red phone. Enhanced 911 provided dispatchers a caller’s name, address and telephone number. Sarpy County became the first agency in Nebraska to receive Enhanced 911 in June 1987. In 1995, the Sarpy County Sheriff's Communications Division merged with the Bellevue Police Department's Dispatch Center, creating Sarpy County Consolidated Communications, a single entity that could receive and dispatch all law enforcement, fire department and EMS calls. In 2000, Sarpy County’s Consolidated Communications Center began using a Computer Aided Dispatch system designed by Printrak International, a Motorola Company. Douglas and Washington counties also use this system, which allows for better communication between emergency agencies in the region. Sarpy County added Text-to-911 in 2017, allowing people to send emergency text messages to the Communications Center. The National Emergency Number Association estimates that 240 million 911 calls are made every year in the United States, 80% of which are made on cellphones. The Sarpy County Board of Commissioners has hired William J. Muldoon to lead the county’s Emergency Communications Department. In the role, Muldoon will oversee Sarpy County’s Emergency Communications Center, which handles all 911 and public safety calls within the county. One of his primary tasks will be to continue efforts to increase coordination among public safety agencies throughout the region. Muldoon joins Sarpy County with 40 years of experience in public safety, most recently as the Director of the Nebraska Law Enforcement Training Center for the past 12 years. He was Chief of Police in Nebraska City for three years and served for 25 years in the Omaha Police Department. Muldoon, who received a bachelor’s degree in Criminal Justice Administration from Bellevue University, has held leadership roles in the Metropolitan Police Chief’s Association, the Police Chief’s Association of Nebraska, and the International Association of Directors of Law Enforcement Standards and Training (IADLEST). He received the Distinguished Service Award from the University of Nebraska Omaha in 2015 and the Leadership Award for Strategic Planning from IADLEST in 2011. He is tentatively scheduled to begin his new role on March 5. Sarpy County and the Sarpy cities received the 2018 Partner in Economic Development Award from from the Sarpy County Economic Development Corp.
Director Andrew Rainbolt, OPPD Economic Development Manager Tim O'Brien and Olsson Associated Director of Business Development Jered Morris. At the annual Sarpy County Economic Development Corporation meeting and awards ceremony on Thursday, Feb. 1, Sarpy County received the 2018 Partner in Economic Development award. The award honors groups or organizations whose contributions pave the way for economic growth. Sarpy County received the award for leading efforts to form the Sarpy County and Sarpy Cities Wastewater Agency. The agency’s purpose is to build a sanitary sewer system to serve the southern portion of Sarpy County, opening the area to further development. Sarpy County shared the award with the five Sarpy cities: Bellevue, Gretna, La Vista, Papillion and Springfield. As a joint effort between the county and the cities, the wastewater agency is a unique approach to building a utility. It will be governed by a 6-member board composed of the chair of the Sarpy County Board of Commissioners and mayors of the five cities. "The Sarpy County Economic Development Corporation wanted to recognize the collaboration and teamwork the county and each of the cities within Sarpy showed when they came together to form the sewer agency," said Andrew Rainbolt, Executive Director of the Sarpy County Economic Development Corporation. "The lack of wastewater infrastructure in south and western Sarpy County is a limiting factor to growth, and although forming the agency is just the first step, it’s a big one." Click here to learn more about the Sarpy County and Sarpy Cities Wastewater Agency. On Tuesday, Jan. 23, the Sarpy County Board of Commissioners approved a bid to repair erosion damage on Pflug Road from 228th Street to 230th Street. The road serves as the primary access road to the Holy Family Shrine, one of Sarpy County's most visited tourist attractions. The road also serves residences and agricultural interests in the area. 'I'm excited to see the repair work begin on Pflug Road. The closure has been an inconvenience to residents and the Holy Family Shrine," Sarpy County Commissioner Jim Warren said. "We received a good bid and look forward to construction beginning." In the spring of 2017, the Sarpy County Public Works Department was moving forward with plans to repair existing erosion damage on Pflug Road when heavy rains in April and May caused massive amounts of dirt to slough off, opening large cracks in the roadway. The damage left the road unsafe for vehicles, forcing Public Works to close Pflug Road from Fishery Road to 228th Street. The new damage required a different, more extensive repair plan. Because of streams in the area, repair plans had to be reviewed and verified by the U.S. Army Corps of Engineers. Sarpy County received verification from the Corps in November and began the bidding process. High Plains Enterprises was awarded the bid in the amount of $438,262.44. The repairs are expected to take 30 working days, which are defined as day when the temperature is above 40 degrees and rising and which are suitable for the construction of this project. It does not include Sundays and holidays. The Sarpy County Public Works Department today reopened Cornhusker Road from 192nd Street to Highway 31. Crews closed the road in August due to an emergent condition on the bridge just west of the railroad undercrossing. Midwest Underground completed abutment work on the bridge, finishing approximately a month ahead of schedule. Click here for updates on current county road closures. Sarpy County Commissioners on Tuesday elected Don Kelly to serve a third term as Chair of the Sarpy County Board. He also held the position in 2016 and 2017. Kelly represents District 1 and was first elected to the board in 2013. His current term expires in December 2020. Commissioners also re-elected District 5 representative Jim Warren to serve as Vice Chair, a position he held in 2017 as well. Paula Creps, director of the Sarpy County CASA Program, will become a member of the Nebraska CASA Association’s Board of Directors. Creps was elected to the board recently after being nominated by CASA directors from Cass and Otoe counties. She will serve a three-year term and has the option to serve a second term. “I am excited to be a part of this board to learn more about CASA on the state and national level, to help create and implement policies and training programs to make our state CASA programs more efficient and purposeful, and to be an active part of the annual Nebraska CASA fundraising event,” Creps said. Creps has been with CASA in Sarpy County since 2013, when she started as Volunteer Supervisor. She has been in her current role since November 2015. Creps has 20 years of experience in the social services field, primarily dealing with children and families. She received her bachelor’s degree in psychology from the University of Nebraska-Lincoln and her master’s degree in public administration from the University of Nebraska Omaha. Sarpy County’s CASA program began in 1986 and was the first CASA program in the state of Nebraska. Other CASA programs followed and by 1995 discussions began about forming a statewide association. In 1998, the Nebraska CASA Association incorporated as a non-profit agency with the purpose of supporting the development and growth of CASA programs. The 14-member state board of directors includes 10 corporate and community representatives as well as four local CASA directors. CASA (Court Appointed Special Advocates) volunteers are appointed by judges to speak in court for the best interest of abused and neglected children. Volunteers make placement recommendations after researching the child’s background. The CASA serves as a stable force in the child’s life during difficult times. To learn more about the Sarpy County CASA Program, to donate or volunteer, visit SarpyCASA.com. Storms stretching across several states this summer created devastating floods that swamped an estimated 500,000 vehicles, according to industry experts. Many of those vehicles will be scrapped, but some will find their way back onto the market. While selling flood-damaged cars isn’t illegal, the damage must be disclosed on the vehicle’s title. Less-than-reputable resellers have been known to leave this information off the title, leaving unsuspecting buyers with an unreliable car. To help car shoppers in Sarpy County avoid unknowingly purchasing a flood-damaged vehicle, County Treasurer Rich James created a website with information and links to check a vehicle’s history. These searches are based on a vehicle’s VIN. If a vehicle has never had a salvage title, you probably will not find any information. However, if it was branded in one state and not another, it should show up with the original brand. Click here to visit the Treasurer’s VIN Fraud Verification Page here. If you have questions about your vehicle’s title, you can call the County Treasurer’s Office at 402-593-2148, 402-593-2119 or 402-593-2108 or visit www.Sarpy.com. 60 racers braved the freezing temperatures on Oct. 28 for the Cops & Robbers 5K Run/Walk. The event kicked off at 9 a.m. at Werner Park, and participants completed a course that took them around the park, parking lot and nearby neighborhood. The post-race party included visits from Sarpy County first responders, a bounce house and music at Werner Park. The event raised $5,000 for Sarpy County Crime Stoppers. The Nebraska Crossing Outlet Mall, Omaha Lancers, Adams & Sullivan Attorneys At Law and Werner Enterprises sponsored the event. The Cyber Security Awareness Month display at the Sarpy County Administration building. Cyber security has been a major concern for many after recent data breaches exposed millions of people to possible fraud and identity theft. To help Sarpy County residents protect themselves and their personal information, we are offering resources and information about dealing with and preventing identity theft; identifying and reporting email and phone scams; cyber bullying; laptop security; online security for businesses and much more. Information packets, flyers and booklets are available for free at the Cyber Security display just inside the entrance to the Sarpy County Administration building. The display and resources are part of Sarpy County’s Cyber Security Awareness Month efforts, which are organized by the county’s Information Systems department. Sarpy County Attorney Lee Polikov has appointed Bonnie Moore to serve as the Chief Deputy Sarpy County Attorney. Moore’s duties will include overseeing attorneys and staff in the Criminal, Civil, Child Support, Victim Witness and Diversion Divisions. She also will advise Sarpy County’s Board of Commissioners, elected officials and department heads on matters of legal compliance. Before assuming her new role, Moore served two years in the County Attorney’s Civil Division, then spent two years as the Sarpy County Human Resources Director. She returned to the County Attorney’s Office in January to be the Lead Attorney for the Civil Division. “I’m looking forward to this new opportunity and continuing to serve the citizens of Sarpy County,” Moore said. Moore received her bachelor’s degree from the University of Nebraska Omaha before attending the Creighton University School of Law. Her husband, Tyler, is a teacher with Papillion La Vista Community Schools. Gov. Pete Ricketts today appointed Michelle Y. Andahl to be the Sarpy County Election Commissioner. Andahl recently worked as legislative staffmember for former State Sen. Joni Craighead. She has been independent marketing and fundraising consultant for multiple political campaigns. Andahl served as the National Federal Legislative Chair for the Nebraska Parent Teacher Association and was a board member of the Joslyn Castle Guild and Sarpy County YMCA. She also has been involved with Child Connect, the Fontenelle Forest Guild and Boy Scouts. She is completing a degree in Liberal Arts and Business. By law, the governor appoints the election commissioners for Douglas, Sarpy and Lancaster Counties. She will begin her new role on Oct. 4. Andahl’s appointment fills the vacancy left after former Election Commissioner Wayne Bena accepted the position of Nebraska Deputy Secretary of State for Elections. Andahl will complete the Bena's four-year term, which ends on Dec. 31. The Sarpy County Sheriff’s Office is going pink for cancer awareness as part of the Pink Patch Project. The Fraternal Order of Police Lodge 3, which represents the men and women of the Sarpy County Sheriff’s Office, will be selling pink patches for $10 each. All proceeds from the sale will go to Leap-For-A-Cure, an Omaha-based organization dedicated to improving brain cancer awareness, education and treatment. Two Sarpy County deputies, Ryan Fawcett and Rick Staack, died after battles with brain cancer in 2012 and 2013. The public can support the cause by buying patches from 9 a.m. to 4 p.m. Mondays-Fridays at the Sarpy County Sheriff’s Office. Since its inception in 2008, Leap-For-A-Cure has raised more than $850,000, with all money staying in the Omaha area. To learn more about the organization, visit LeapForACure.org. The Pink Patch Project started in 2015 at the Irwindale Police Department in California as a fundraiser for breast cancer awareness and research. The movement spread quickly, and there are more than 130 agencies participating and supporting various cancer charities. Several local agencies, including Sarpy County 911, are taking part this year. The Sarpy County Board of Commissioners on Tuesday, Sept. 19, approved an interlocal agreement with the cities of Bellevue, Gretna, La Vista, Papillion and Springfield to create the Sarpy County and Sarpy Cities Wastewater Agency. Once approved by the five cities, the agency will oversee the construction of a wastewater system to serve the southern portion of Sarpy County, where limited sanitary sewer service is currently available. The lack of a sewer system is an impediment to development in southern Sarpy County as well as in the cities within the county. The agency serves as a regional solution to address that issue. As a joint effort between the county and cities, the agency is a unique approach to building a utility. It will be governed by a 6-member board composed of the chair of the Sarpy County Board of Commissioners and mayors of the five cities. The agency’s budget will need to be approved each year by the Sarpy County Board of Commissioners and the five city councils. The interlocal agreement also was approved by the city councils in Gretna, La Vista, Papillion and Springfield on Sept. 19. Bellevue will take up the issue on Sept. 25. OFFUTT AIR FORCE BASE, Nebraska – The 55th Wing has rescheduled an emergency response exercise that was scheduled to begin on the base after 5 p.m. Wednesday. The exercise is now scheduled to begin after 8 a.m. Thursday, Sept. 21. During the exercise, base personnel and members of the local community may hear loud noises or see emergency response vehicles responding to the exercise area. This is a routine training exercise designed to test the tactics, techniques and procedures of base emergency responders and personnel. For more information, call 55th Wing Public Affairs at (402) 294-3663 or email 55WG.PA@us.af.mil. Sarpy County residents can get rid of their old tires for free on Oct. 21 at the Sarpy County Fairgrounds in Springfield. Sarpy County will collect scrap tires at the south end of the fairgrounds at 142nd Street and Pflug Road on a first-come, first-served basis from 8 a.m. to 4 p.m. or until reaching 150 tons of scrap. People will be required to provide a driver’s license or OPPD bill with an address to prove they live in Sarpy County. There is no limit to the number of tires a person can bring, but when participants check in they will need to report the number of tires they are dropping off and where the tires came from. Rims and tubes won’t be accepted, nor will drop-offs from retailers. Participants have to unload their own tires. To avoid traffic issues on South 144th Street/Highway 50, participants should not turn onto Pflug Road from South 144th Street/Highway 50. Instead, participants should approach the fairgrounds from the east. If traveling on South 144th Street/Highway 50, turn east onto Main Street, then south onto South 1st Street and finally west onto Pflug Road. The scrap tire collection is being funded by a grant from the Nebraska Department of Environmental Quality. Residents with questions about the event should call Sarpy County Environmental Services at 402-253-2371 or visit Sarpy.com. The Sarpy County Board of Commissioners adopted a new Comprehensive Plan on Sept. 12, 2017. The plan creates a unified vision for the build-out of Sarpy County and integrates the growth plans for its five municipalities. Over the past several decades, Sarpy County and its communities are among the fastest growing areas in Nebraska. The vision of this plan was to create the tools and policies to manage this growth to promote optimal build-out for the area through the long-term future. The Comprehensive Plan unifies existing countywide planning efforts under a single umbrella document, while recognizing the important planning initiatives undertaken by Sarpy County agencies and all levels of government and community organizations. The plan focuses on seven key topics: county facilities, land use and management, utilities and infrastructure, transportation, environmental resources and recreation, economic development and energy. Moody’s Investors Service upgraded Sarpy County’s bond rating to Aaa, the highest rating offered by the organization. The county previously held an Aa1 rating, the second-highest rating. Both ratings are considered extremely strong. “This outstanding bond rating is a result of strong growth, a well-thought-out and fully funded pension plan, a thoughtful cash reserve, the investment taking place at Offutt Air Force Base and a strong and healthy financial structure,” said Sarpy County Board Chair Don Kelly. This is the first time the county has received an Aaa rating, which means Sarpy County will qualify for the lowest possible interest rates, resulting in lower costs for Sarpy County taxpayers. In assigning the rating, Moody’s cited the county’s economic ties to the growing metropolitan area, a low pension burden and stable financial operations with healthy operating reserves. Board Vice Chair Jim Warren credits the rating to fiscally conservative elected officials and Sarpy County’s administration, specifically Fiscal Administrator Brian Hanson. Moody’s rates bonds on a scale from Aaa to C, with Aaa bonds being deemed the highest quality with the lowest credit risk. Sarpy County, population 158,840, is just south of the City of Omaha and is home to Bellevue, Gretna, La Vista, Papillion and Springfield. Sarpy County is also home to Offutt Air Force Base. Reminder, on Wednesday, September 13th, 2017, Sarpy County Public Works along with Western Engineering Company will close 168th Street from Giles Road to Harrison Street thru traffic. Bridge and roadway rehabilitation and maintence work will take place along this section of roadway. The closure is anticipated to last approximately 8-10 weeks, weather dependent. Phase A will be a 30 Working Day Closure from Josephine Street south to Giles Road. Phase B will be a 12 Working Day closure of 168th From Josephine Street north to Harrison Street. 168th Street from Giles Road to Harrison Street will be closed to thru traffic for the duration of the project. The project is in response to an emergent condition of the bridge abutments over the BNSF Railroad that will require the closure of 168th Street. While the roadway is closed, there will be a drainage project to address erosion to the South Papillion Creek, and a project to correct pavement failures in the asphalt paving from approximately Gertrude Street to Harrison Street. These pavement failures are best addressed at this time to minimize traffic disturbance. Currently, roadway widening is being contemplated from HWY N370 to Harrison Street, and the goal of this project is to preserve this section of roadway up and until the widening is to commence at a future date. Millard Park residents who live off of 168th and Josephine, please note you will detour north in Phase A and detour south in Phase B. Cedar Ridge residents and RCI Roofing will detour to the south for the entirety of the project. All other developments are to utilize other access points as best as possible. Should you have any questions feel free to contact Brian Becker, Construction Manager, Sarpy County Public Works at 402-537-6924. Effective today, 8/18/17, Sarpy County Public Works has closed 234th Street from Pflug Road to US HWY 6 to thru traffic. The bridge north of Pflug Road has been closed due to an emergent condition. The bridge is closed to all traffic, and the roadway closure will be in effect until further notice. We are asking the traveling public to be aware of the closure and to find alternate routes of travel. Local traffic will be allowed to access all properties throughout the duration of closure. Beginning at 10:00 am on Monday, August 21st, 2017, Engemann Drainage Company will close Capehart Road from 204th Street to 192nd Street to thru traffic. Engemann Drainage Company will be constructing a sanitary sewer crossing just east of 204th Street. This closure is tentatively expected to last 4 days, weather dependent. Cornhusker Road Closed between Hwy. 31 and 192nd St. Effective IMMEDIATELY, Sarpy County Public Works has closed Cornhusker Road from HWY 31 to 192nd Street to thru traffic. The bridge west of the railroad undercrossing has been closed due to an emergent condition. The bridge is closed to all traffic, and the roadway closure will be in effect until further notice. Further updates will be posted as available. Due to weather conditions this project did NOT start on Wednesday, July 26 but rather Friday, July 28. New estimated completion date is Wednesday, August 2. Beginning Wednesday, July 26 through Friday, July 28, Ruff Grading will be closing 108th Street from Cornhusker Road to Wittmus Drive during the day from 6:30 a.m. to 6:00 p.m. During this time the contractor will be using large equipment to move a substantial amount of dirt from the east side of 108th to the west side. The road will be opened each day during the evening hours. It is anticipated that the closure will be for these 3 days. Weather permitting. Beginning Monday, July 24, 2017, Sarpy County Public Works will be closing Fairview Road from 114th Street to 120th Street. They will be removing an existing metal culvert and replacing with a larger metal culvert and re-profiling the roadway. It is anticipated the project will be completed in two weeks, weather permitting. We are asking the traveling public to be aware of the road closure and the appropriate detours. Residents will be allowed access to their property during construction. The Sarpy County Board of Commissioners is pleased to announce the appointment of John M. Hubbard as Sarpy County’s new Corrections Director. Mr. Hubbard, a Papillion resident, currently serves as the Deputy Director of the Douglas County, Nebraska Department of Corrections. He has over 36 years of experience in the field of corrections, including 22 years in senior corrections leadership, twice serving as Interim Director of Corrections in Douglas County. He has a Bachelor’s Degree in Criminal Justice Administration from Bellevue University and is the recipient of several honors and awards from Douglas County and the American Correctional Association. He was selected from over 30 applicants from across the nation. His appointment will be effective on September 5, 2017. On or before June 1, in addition to the notice of preliminary valuation published pursuant to section 77-1301, the county assessor shall notify the owner of record as of May 20 of every item of real property which has been assessed at a value different than in the previous year. Such notice shall be given by first-class mail addressed to such owner's last-known address. It shall identify the item of real property and state the old and new valuation, the date convening of the county board of equalization, and the dates for filing a protest. Beginning Monday April 3rd, 2017, 114th Street from Hwy 370 to Schram Road and Schram Road from 114th Street to 111th Street will be closed to continue with grading, storm sewer and paving of 114th Street and Schram Road. The completion of this project is June 5, 2017, weather permitting. We are requesting the traveling public to be aware of the road closures and to find alternate routes of travel. The preparation of this report has been financed in part through grant(s) from the Federal Highway Administration and Federal Transit Administration, and the U.S. Department of Transportation. The contents of this report do not necessarily reflect the official views or policy of the U.S. Department of Transportation. This document is disseminated under the sponsorship of the U.S. Department of Transportation in the interest of information exchange. The U.S. Government assumes no liability for its contents or use thereof. The U.S. Government does not endorse products or manufacturers. Trademarks or manufacturers’ names appear in this report only because they are considered essential to the objective of the document. Sarpy County is again pleased to partner with the cities in Sarpy County to offer spring and fall clean up events to residents. The County’s willingness to waive its landfill charges has been part of the program for many years and has helped the communities provide an opportunity for citizens to dispose of unwanted trash at no cost. To analyze transportation and land use options for the corridor. To inspire healthy living and strengthen community through a state-of-the-art, championship athletic park accessible to all.